custom domed SAPPHIRE crystal just like the 10460 -------No this is not a Rolex nor a Rolex copy – it is a watch that bears similarities to the 5513 but, that stands on its own. 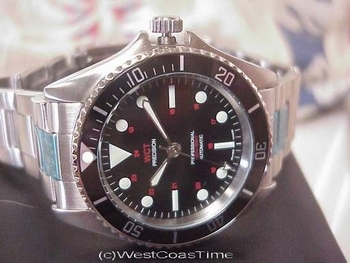 This is the WCT Precision Diver. 25 jewel Swiss movement and 200 meter depth pressure tested. There has been a need for a new watch among people who cannot or will not pay the price of certain excellent but, very expensive watch companies like R*lex and others – they offer wonderful timepieces but, the prices are not in keeping with everyone’s budget for an EVERYDAY watch or less than $1000 solid dive watch. There is also a group of watch sellers, collectors and just people who chat about watches call “beaters”. A beater does not need to be ugly and cheaply made. This is such an example of a reasonable priced watch with the looks of a sub in many ways a military like dial with refinement and a classy look that can be worn by a man or a woman – it comes on an oyster steel solid stainless bracelet with adjustable links and clasp with flip lock OR the genuine NATO band from the UK for NATO forces – your choice !– yes you can dive with it, it is tested to 200 m water resistant with a SCREW DOWN crown and back. If you wish to read an independent review and also some added quality photos click on this link please. It has a firm uni-directional ratcheting bezel ( not inexpensive friction which slips) . This watch has as its power plant a new ETA 2824-2 automatic self-winding movement which is shockproof and all Swiss made. The is the same movement used by MANY MANY of the worlds’ best watchmakers for their watches for reliability, and ease of repair and parts are always available although unlikely you will ever need to do that. You cannot walk in a room with the watch showing without someone asking you about it. For those who have too many expensive watches you no longer need to pack a junk watch when you travel and leave your sub at home this one will see you through the whole trip over and over again.